One of the joys of this adventure has been the “jeep days” when Evan and Barry get to spend a day working on the jeeps. The latest “jeep day” was no exception and we accomplished a list of tasks needed to get Ole Blue ready for another season of shows. 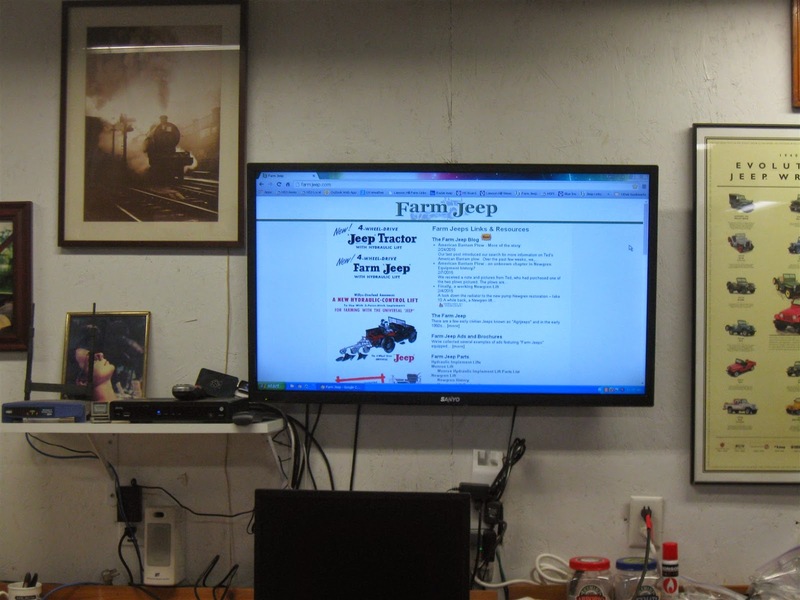 The latest addition to the Farm Jeep garage is a 40” TV/PC monitor. 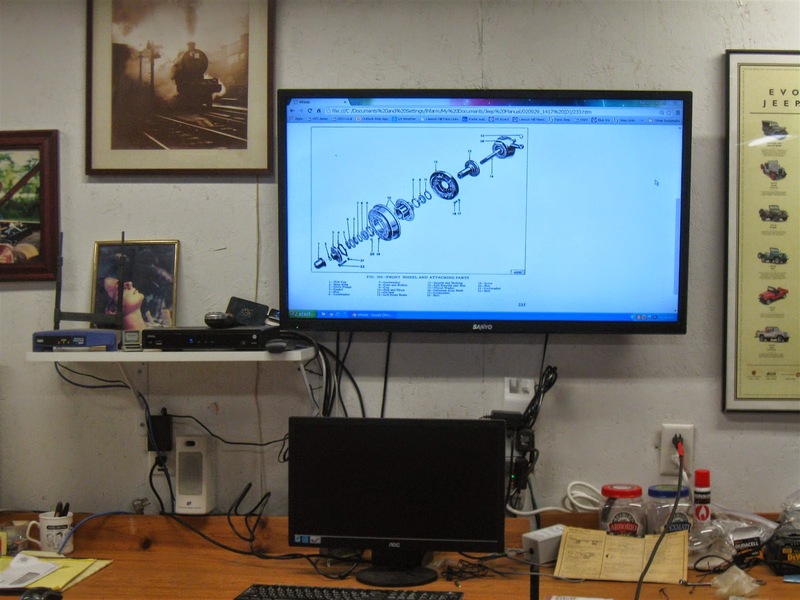 It is perfect blowing up parts diagrams and watching the occasional TV show. One of those TV shows provided Evan with the solution to our non-working Newgren between-the-seats control. 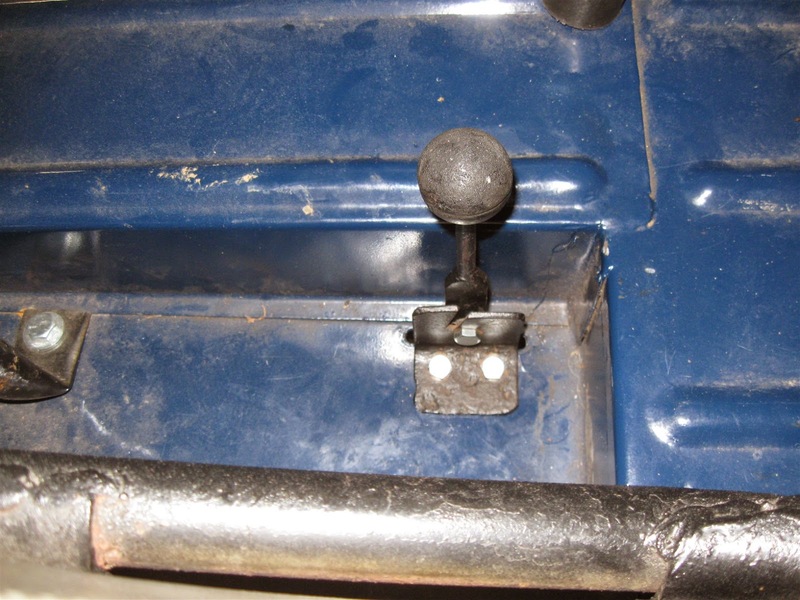 A special feature of the Newgren lift is the ability to control the lift at the rear of the jeep and from the driver’s seat. 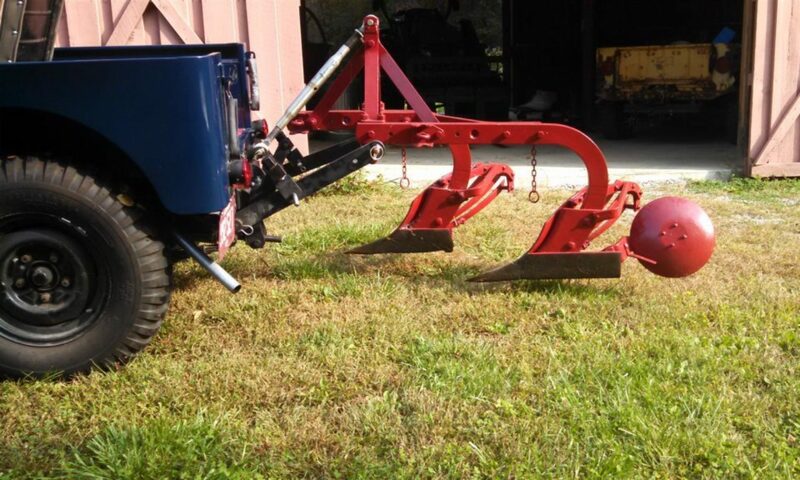 When attaching implements, it is very handy to be able to make fine adjustments to the lift height without having to leave the rear area. We were extremely lucky that our lift came with the driver control rod and lever. Unfortunately, after moving the lift from the CJ2a to the CJ3a, the driver control hasn’t worked correctly. We could either make the lift rise or lower it by altering the length of the control rod, but not both. The British TV series WheelDealers is a favorite of ours and was the source for Evan’s inspiration in fixing the Newgren. 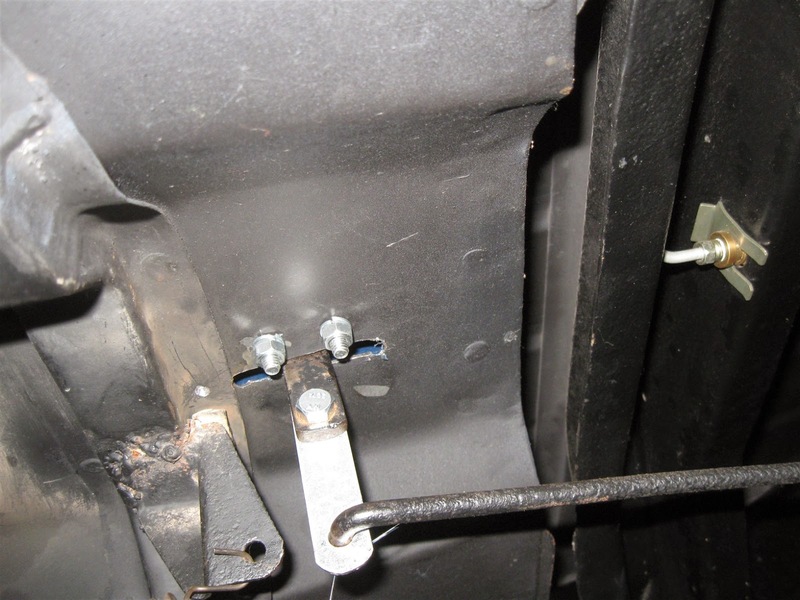 In one episode, Edd China, the mechanic, demonstrated how to determine the changes need to convert a shift lever from a “long-throw” to a “short-throw”. Since there were no conversion kits available, Edd designed his own. Using Edd’s example, Evan diagnosed the problem, built a prototype and designed the fix. The control had been installed according to the instructions. As stated, it worked perfectly on the 2a. But as listed on Farm Jeep, there are dimensional differences between the 2a and 3a. While not major, we believe they were enough to alter the geometry. We also are working with a reproduction body. That may have added to the issue. The day’s accomplishment didn’t stop there. We took the wobble out of a front wheel, aided by the service manual (displayed on the big screen) and service the steering knuckles with John Deere Corn Head Grease. Evan scored his second victory of the day by modifying a spring to correct an accelerator linkage issue. Although an OEM spring was installed, it was too strong, preventing operation of the throttle cable. Again, this is probably a problem with the geometry of our engine/body. Rather than chasing the problem, we choose to go with a workable solution.